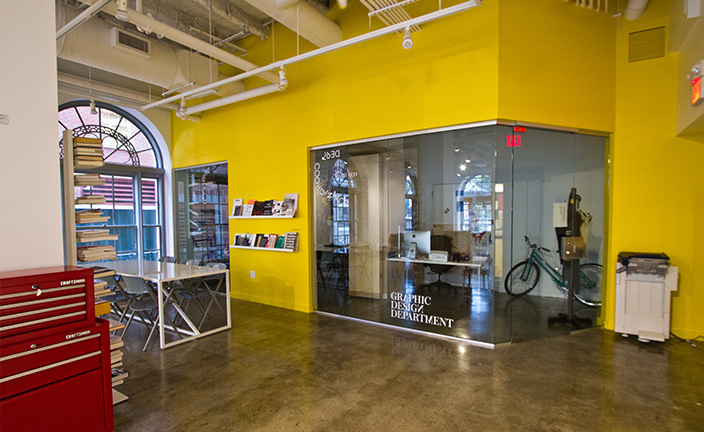 RISD's Graphic Design Department was seeking to develop a common, multi-use space that would allow the department to host various shows, events, and gatherings. The first floor of the building that houses the Graphic Design Department provided the location they were looking for. In developing a plan for the floor, the administrative offices were moved to locations that allowed for improved coordination and better temperature control. 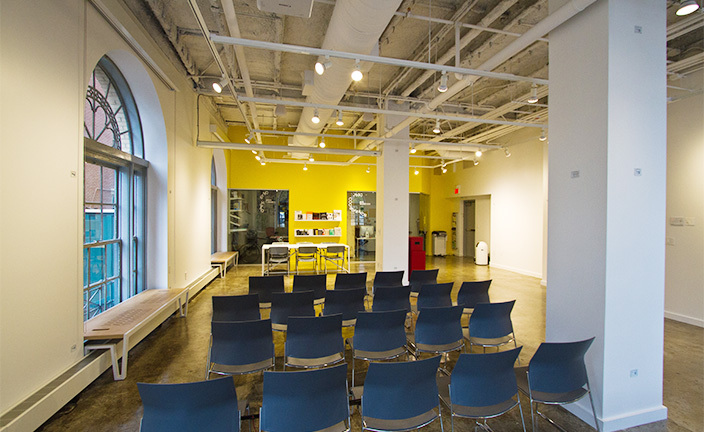 The gallery space occupies a central location. The administrative offices make highly efficient use of space. They are partitioned at the back of the larger gallery by a bright yellow wall skewed to be orthagonal with the exterior and making the interior a bit more generous for the occupants. A frame less storefront system give these modest offices a strong connection to the outdoors and community connection. The GD Gallery plan was reduced to the essentials and it was constructed with honest durable materials. It is designed for work and viewing, not to draw attention to the architecture. Where design elements are required, LLB steered clear of commercial solutions and instead, prepared the space to accept uniquely RISD constructions.